This month, our visitors are invited to pick a 3D mushroom to celebrate the autumn, its beauty, its flavors and its colors. Using the open source software Blender we have sculpted in three dimensions the shape of a mushroom and have applied on it such a texture that looks like the wall used as a background in this website. Just click and drag to make it rotate. You can go up or down, right or left to discover the different sides of this 3D object. As a matter of fact, the 3D mushroom doesn?t move at all, it stays in the same place. The light showing each of its parcels doesn?t move either. By moving your mouse you just move the camera and make it turn around the mushroom. It creates all the more the illusion that the mushroom rotates on itself that the leaf on the background stays still as if the time would have stopped on the reflecting surface of the dew reflecting our logo. Our web agency of Provence keeps in mind the importance of the mushroom (barigoule ) in our local customs. In the old days, men used to wear a mushroom shaped hat called hat a la berigoule (capeu a la barigoule ). 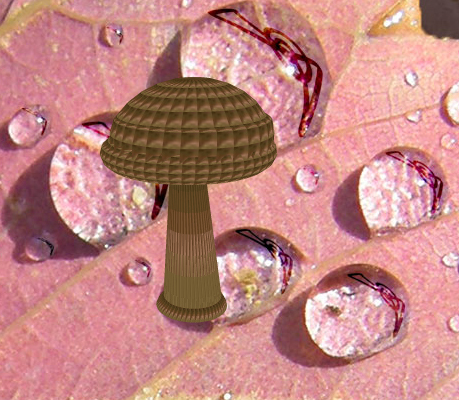 In regards to its shape, our 3D mushrooms must be a lepiote. Before eating stuffed mushrooms as we cook some in the French Riviera, we offer to our visitors the opportunity to discover our phenomenal 3D mushroom.